Why does this yogini care about sauerkraut? Well, our gut needs good bacteria to break down food during digestion. 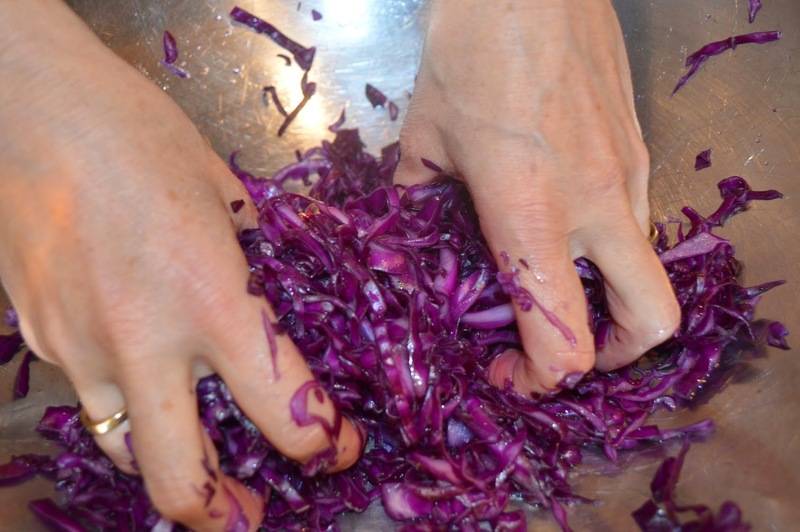 Good bacteria, lots of vitamin C and A (more than in fresh cabbage), and special enzymes that help our bodies break down food are created during the fermentation process of cabbage. Many of us think of booze when we hear the word fermentation. Yet, it has been used for centuries to make bread, miso, kimchi, yogurt, pickles and certain cheeses. Fermentation is a natural process that converts sugar to alcohol, acids and/or gasses. It is used for preservation of food, making alcohol and generating large amounts of microbes. Most of our diets have changed dramatically over the last few decades and our digestive systems need help in maintaining the natural flora that “should” be present. Yes, you can take probiotics and I do when I am doing a cleanse (you can read more about my upcoming group cleanse) or taking medication that could compromise my gut–like antibiotics, which I avoid when I can. It is best if we can get the diversity that we need in our gut, naturally through our diet. What happens when we don’t have fermented foods in our diet? Any diseases that are related to poor digestion, constipation, IBS, compromised immunity, yeast overgrowth, as well as illnesses some might not think as connected to digestion like skin disruptions, mood swings and irritability, food allergies, weight issues, and even autism. Most of the time I eat plain yogurt — dairy or non-dairy (when my predominantly Kapha dosha is in balance). As a kid, I didn’t care for sauerkraut and had never heard of kimchi. We did eat lots of pickles and homemade yogurt. I had played around with to making homemade sauerkraut. I have a friend who makes kimchi (kind of a spicy Korean version of kraut) all the time, and people love hers. But, I haven’t found a kimchi recipe that speaks to me yet. When I do, I’ll share it. 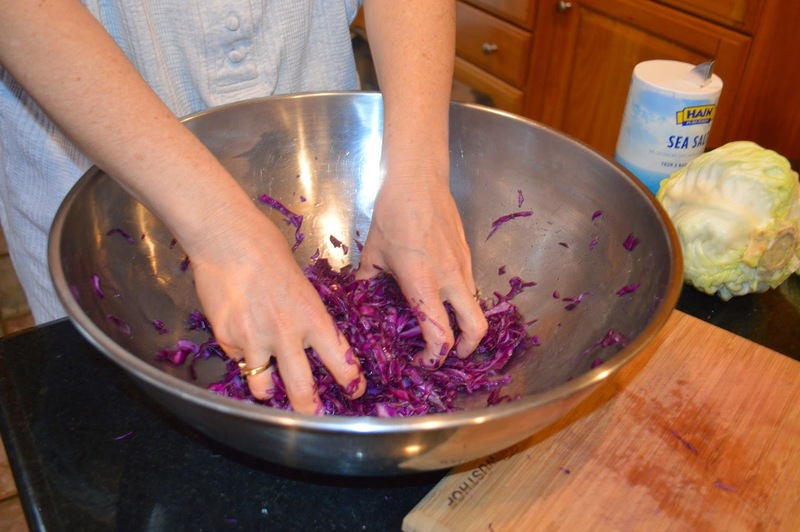 I had been toying with making sauerkraut and tried various recipes; none of them had been to my satisfaction–until I found this recipe last year. 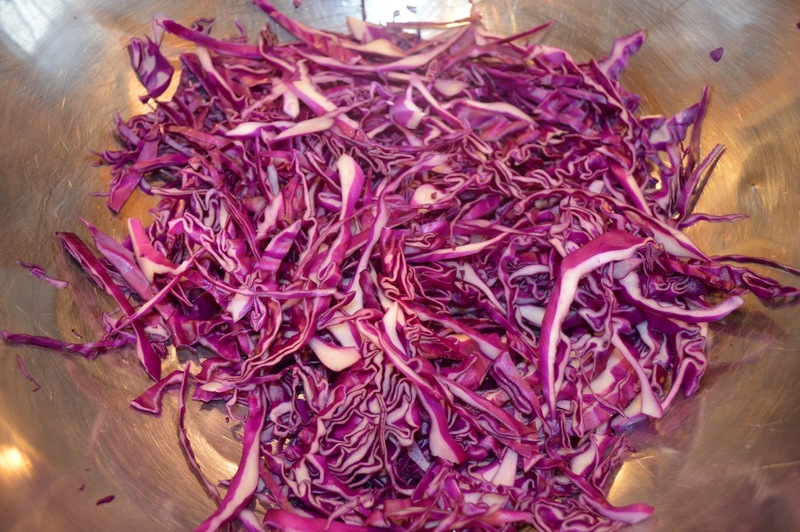 Cabbage naturally has Lactobacilli on its raw leaves. Feel free to add in carrot, green apple, celery, caraway or celery seeds, whatever you want after you do your first batch. Wash cabbage. Take off outside leaves and reserve. 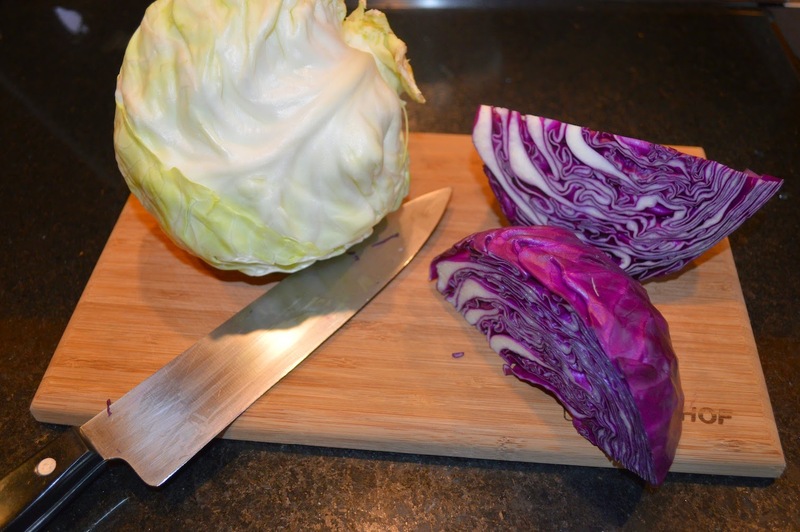 Chop cabbage; I like to quarter and core it and then slice it into thin strips. Add about 1 Tablespoons of salt per medium head of cabbage. You will notice that liquid starts to be released (salt make the cells shrink so the water comes out). 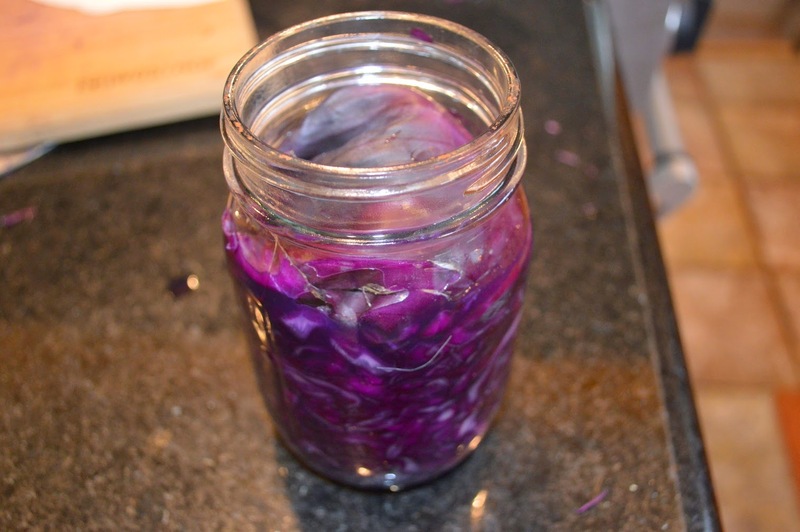 Press cabbage and liquid into a sterile jar. Pack it in as much as you can. Make sure liquid covers all of the cabbage. Place one of the outside leaves on top of liquid. 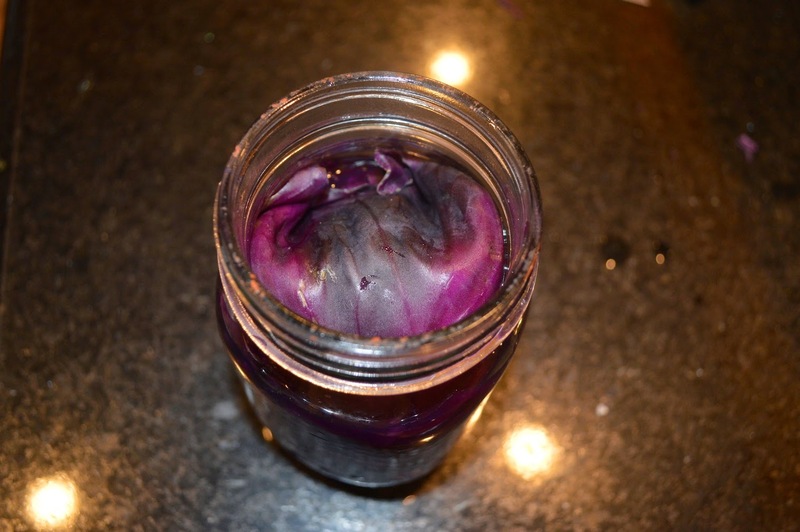 Cover the jar with a coffee filter and rubber band. Place in a cool place to ferment. 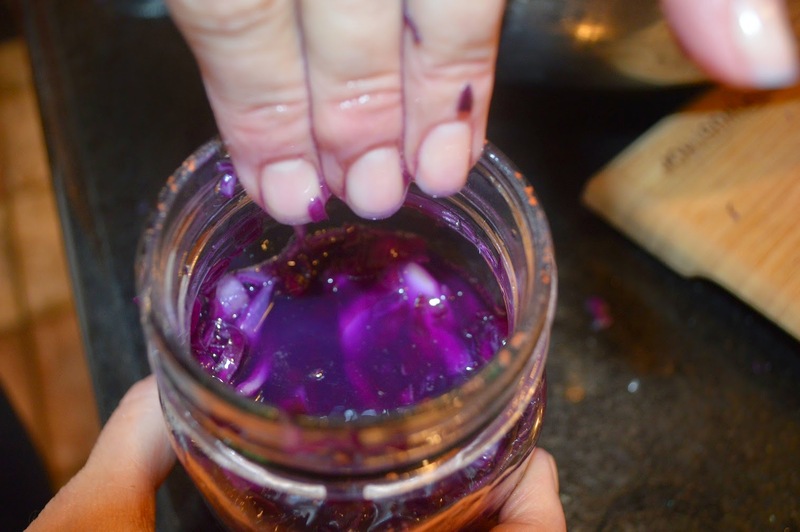 Check your jars each day to ensure that the cabbage stays under the liquid, and use a clean hand to push them back down if necessary; be sure your hands are clean. Taste test every few days – it’s done when you think it tastes good to you! It can take anywhere from 1 to 5 weeks. Remove the filter and add the lid. You can store it in the fridge for months. If you see or smell any unfriendly bacterial growth, throw it out and begin again making sure that all of your equipment, hands included, is clean. 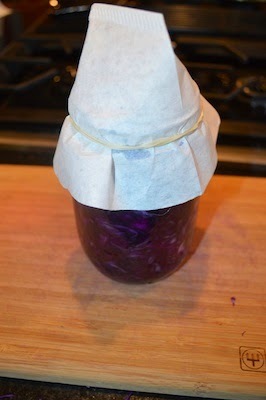 I’d like to thank Bonzai Aphrodite for the easy-to-use and helpful blog post on how to make sauerkraut. I’d love to hear about your experiences, recipes or antidotes about fermented foods. I will be guiding a group online and in person through a month-long cleanse. Click here to read more and register.